A Post Office Box can also be used to measure an unknown resistance. 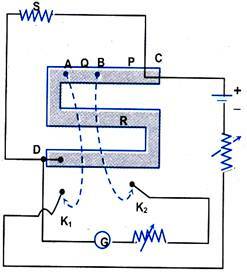 It is a Wheatstone Bridge with three arms P, Q and R; while the fourth arm(s) is the unknown resistance. P and Q are known as the ratio arms while R is known as the rheostat arm. R = R0 + 1 (ohm) are the resistance in rheostat arm, for which the deflection in galvanometer is in opposite direction, then it implies that the unknown resistance ‘s’ lies between R0 & (R0 + 1) ohm. Now, the resistance in P and Q are made 100 W and 1000 W, respectively, and the process is repeated. Equation (1) is used to compute S. The ratio P/Q is progressively made 1:10, and then 1:100. Thus, the resistance S can be accurately measured. These errors may be removed by using thick connecting wires, clean plugs, keeping the circuit on for very brief periods (to avoid Joule heating) and calculating the sensitivity. In order that the sensitivity is maximum, the resistance in the arm P is kept close to the value of the resistance S.